Automakers and tech companies are rushing to bring autonomous driving systems to market and accumulating mileage with their test vehicles. Tesla is taking a different approach by accumulating mileage with its customer fleet through its Autopilot driver assist program. 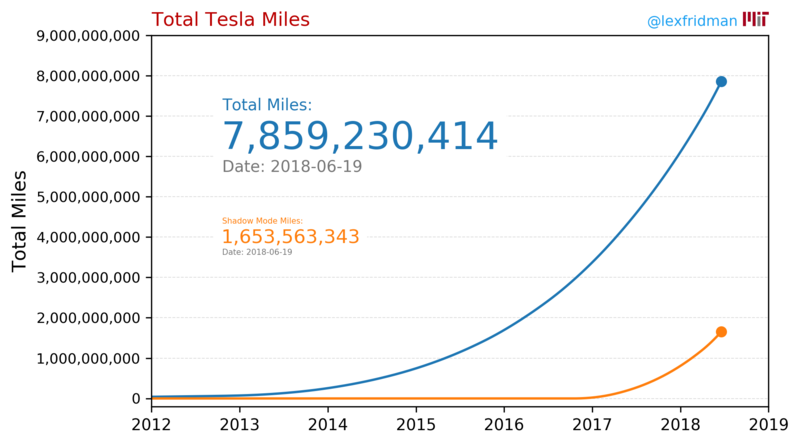 A new report now estimates that Tesla has accumulated over 1.2 billion miles on Autopilot and more than twice that when accounting for mileage in ‘shadow mode’. The report was produced and is being updated by a MIT Human-Centered AI team led by Lex Fridman. We reported on the team’s work with Tesla Autopilot in the past after they launched a study on driver interaction with Tesla Autopilot features last year by adding driver-facing cameras to Model S vehicles. They released some interesting preliminary results and Fridman, the Research Scientist at MIT responsible for the study, said that he had been in contact with Tesla about his research and he believes the technology is required to enable more advanced autonomous features. As part of their continuous work with Autopilot, they have been trying to track Tesla’s total miles accumulated using the driver assist system. To be clear, that’s the mileage driven with Autopilot activated. Back in 2016, Tesla already had 1.3 billion miles driven with vehicles equipped with Autopilot. Tesla can still use data from those miles, but it’s not the same has mileage driven with Autopilot on. That data is often referred to as “shadow mode” mileage because the autonomous driving system runs in the background of the vehicle without being able to have any input on the driving. In both cases, they plotted the data based on the few occasions when Tesla actually released some of the data. It can be difficult to do that since the growth is exponential but not necessarily stable since Tesla said that it can detect dips in Autopilot usage by its fleet when there’s negative media coverage, which has been quite common over the last year. 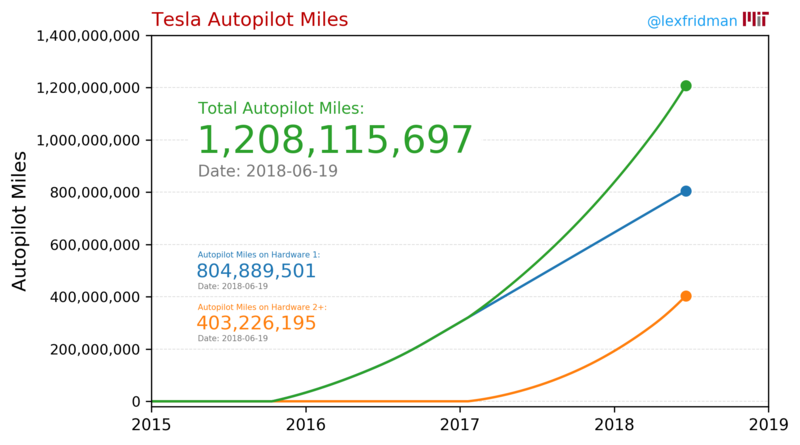 What would be particularly interesting about Tesla crossing 1 billion miles of Autopilot use is that CEO Elon Musk has previously mentioned the milestone as the minimum they would need to move Autosteer from ‘beta’ to a regular feature. Musk recently said that Autopilot is going to get some significant updates this summer and he says that progress could lead to the promised fully autonomous software being ready for the end of next year. Though he also said that Tesla’s version 9 software update is coming in August with the first ‘full self-driving features’. As for the kind of data that Tesla collects from Autopilot, we recently got a rare great look at what Tesla Autopilot can see and interpret – pictured above.